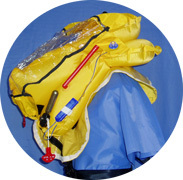 ROARING FORTIES™ SMA2158 (CASA approved) inflatable twin chamber jacket has a spray hood attached. This is very popular with aviation pilots and their crews. Apart from commercial users, Australian Maritime Safety Authority Search and Rescue Wing personnel also prefers the use of this jacket. It is operated with 2 x 18gm CO2 cylinders and has a buoyancy of greater than 195 Newtons (44lb or 19.95kg) after 24 hours. 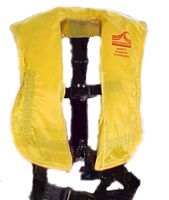 The lifejacket will take only 3 seconds to right a person to an altitude of at least 30 degrees to the vertical with mouth & nose well clear of the water.This jacket will provide good rear and lateral support and is stable in either direction.